Here are some kid-friendly books and a video to help a young person start to learn about birds (and the beach, and trees, and butterflies, too). 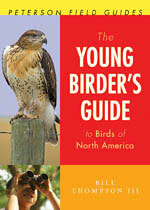 For the serious birder who happens to be still a kid, we strongly recommend the Young Birder's Guide. The beginner's guides cover the birds that are easiest to find. For a young child, the Take a Walk books give them the chance to draw pictures or take notes. Click on a picture or link to see more information and prices.